The purpose of this study is to examine employees’ acceptance levels towards e-learning in the workplace. By using The Unified Theory of Acceptance and Use of Technology (UTAUT), our model captured the effect of factors influencing employees’ intention to use e-learning in the workplace. Data was collected from 261 employees in a food service company in South Korea and only 226 of the 261 responses were analyzed due to errors through LISREL. The results showed that the attitude of employees towards technology significantly and directly impacted employees’ intention to use e-learning the workplace. Yoo, S.J. & Han, S.h. (2013). The Effect of the Attitude Towards E-learning: The Employees’Intention to use E-learning in the Workplace. 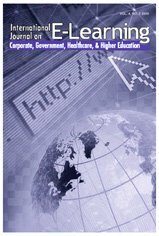 International Journal on E-Learning, 12 (4), 425-438. Waynesville, NC USA: Association for the Advancement of Computing in Education (AACE). Retrieved April 21, 2019 from https://www.learntechlib.org/primary/p/38480/.